The month of May 2013 marked the tipping point when atmospheric measurements of carbon dioxide passed the 400-parts-per-million threshold for the first time since the beginning of human civilization. Environmentalist and climate activist Bill McKibben has been out front alerting the public that scientists warn that level needs to be cut to 350 in order to avoid long-term climate catastrophe from the greenhouse effect. McKibben has written several books on global warming and alternative energy and is also the founder of the grassroots climate movement 350.org. Scientists, including McKibben, assert that an accelerated greenhouse effect will be the outcome if 350 ppm is exceeded, and that translates directly into bizarre and erratic climate change. 350.org is behind what's considered to be the largest globally coordinated protest, with 5,200 simultaneous demonstrations in 181 countries. 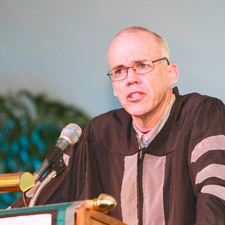 Bill McKibben was the keynote speaker at Eckerd College’s graduating class of 2013 in St. Petersburg. He addressed graduates and their families at the Golden Anniversary of Eckerd College’s commencement ceremony. Before the speech I sat down with Bill McKibben and began by asking about the name of his organization. We also discussed, among other things, some of the climate issues facing Florida.